At a moment when even some on the left are criticizing the liberal media's wildly overheated coverage of the Mueller probe and "Russia-gate," one angry voice is out there, bitterly defending the MSM's excesses. His name is Joe Scarborough, and he opened today's Morning Joe with an epic rant in defense of the liberal media, and in denunciation of its critics. 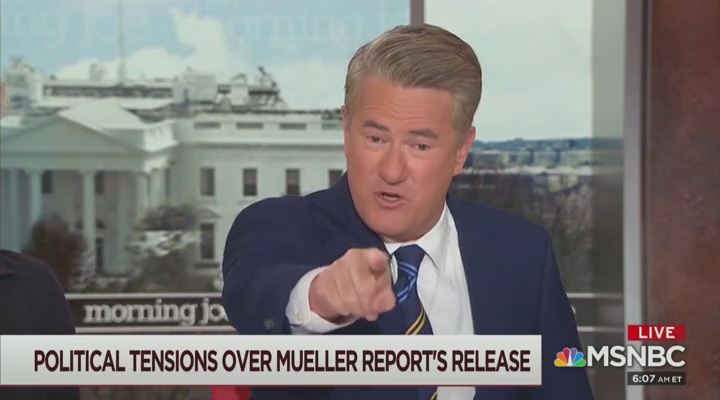 The essence of Scarborough's tirade was that the MSM had no choice but to cover the story the way that it did, given the "lies," admitted and alleged, by a variety of Trump associates regarding contacts with Russians. A visibly agitated Scarborough spit venom at those who have dared to criticize the MSM for its coverage. "Just because you're sucking up to Donald Trump and just because power is all that matters to you, and just because you will justify everything that man does and just because you are corrupt, just because you're not a journalist, just because you have sold your soul to a personality, don't knock reporters at the New York Times or the Washington Post or the Wall Street Journal or the broadcast networks for doing their job right." Scarborough chooses to ignore the media's fundamental failure in its Russia-gate coverage. Yes, it's appropriate to report inconsistencies, prevarications, lies if you will, by Trump associates. The key word being "report." It's something entirely different for supposedly objective journalists to spin wild theories about Trump being a Russian agent, about the imminent demise of American democracy, about the 2016 election having been "stolen" from Hillary Clinton.